Living in Evergreen, Colorado gives one a sense of alpine wonder. Last week I stopped counting when I got to 120 elk walking through our back yard open space: we have foxes, coyotes, mountain lions, bobcats, bears, deer, and at least one rhinoceros. I’m sad sometimes when I think that we’ve encroached on the habitat of the Colorado Rhino. Is this where you live? Where did the rhino come from? 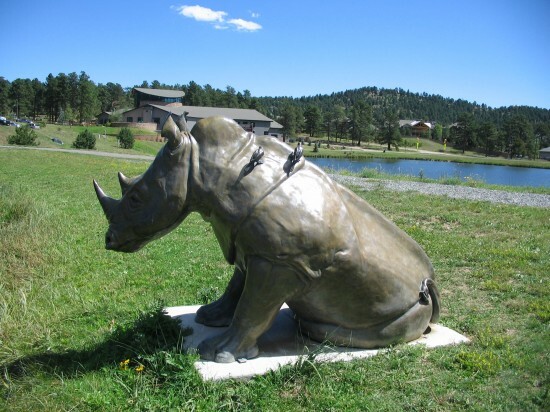 I always knew there were rhinos in Colorado! Yes Evergreen is where we own a house. 25 miles from downtown Denver, and about 2500 feet higher in altitude. The city has sculptures on this path for almost 5 miles, and this one scares the hell out of Maggie, our Goldendoodle. Maggie will walk among the elk trudging through our back yard like they’re her pals, but the first time she saw this she almost took my arm out of the shoulder socket!